It's time to get some projects finished off! 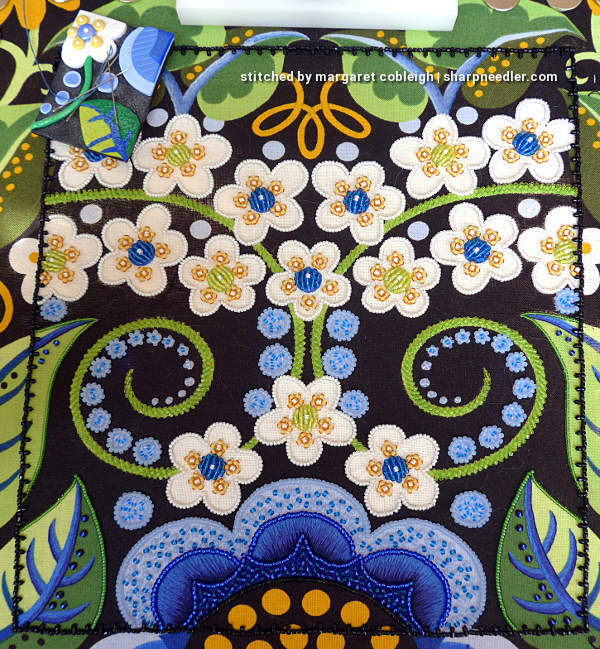 Before I start anything new, I am determined to complete the embroidery on Antique Society Silk Violets, Summer of Love challenge (aka: SFSNAD Challenge), and Wild Child. Wild Child, the Japanese bead embroidery project, requires the most work so I've been focusing on it when I have a spare moment. (I'm also preparing to teach the stumpwork hedgehog piece over the next couple of months.) At the moment--with Wild Child--it's all about outlines and the blues. In the last episode of Wild Child, I was working on adding some surface embroidery. 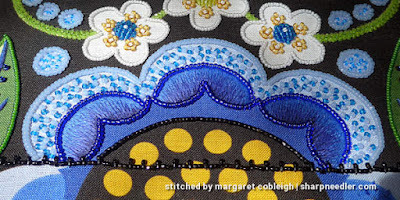 I've completed most of that and have returned to beading. There are lots of elements to be outlined, lots and lots of elements! I'm currently focused on the lower half of the project. The blue circles and assorted leaf outlines were completed first. Then it was on to the big flower at the bottom of the design. I outlined the lighter blue petals and I'm quite pleased with how they turned out. I'm getting better at this whole 'using a beading koma to make smooth lines' thing! Next, I outlined the thread painted blue petals with royal blue beads and things started to get interesting. 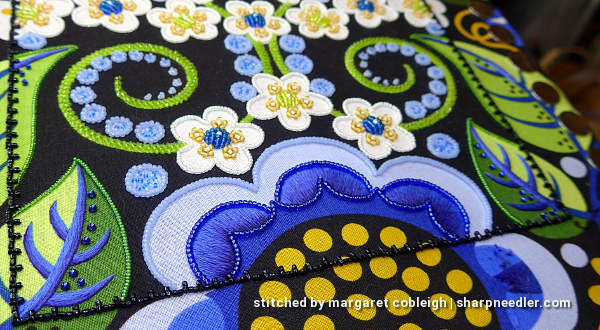 (Recall that all surface embroidery is something I added/changed.) When you change something in a kit/design, there are often consequences. If you change an element you can create a cascade of problems. 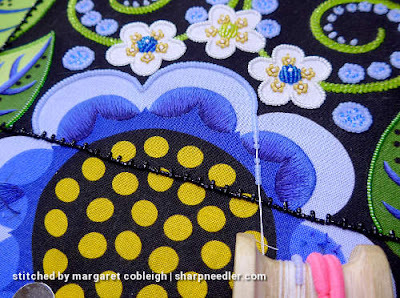 In changing the veins on the side leaves from beads to thread, I eliminated a major usage of the royal blue beads. In my version, using those beads to outline the thread painted blue petals introduced a colour and bead that now wasn't being used anywhere else and that unbalanced the design. I needed to find some new places to put the royal blue beads. There are some black dots on the side leaves that are supposed to have black beads. I decided to change them to royal blue and to also add a few royal blue beads as accents on the leaves along the sides a little further up. That should restore some of the colour balance. 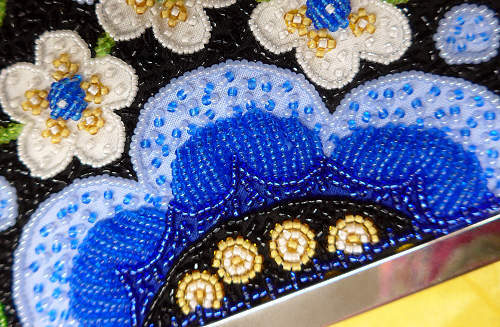 The light blue petals were filled with para (pairs of beads stitched down like seed stitch) that included a peacock blue coloured bead. 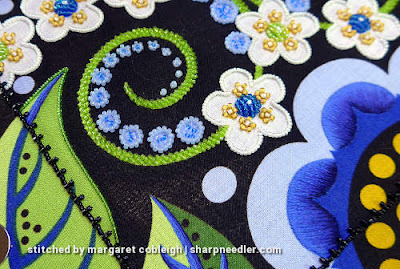 In the original design, the area below my now-thread painted petals, which I call the 'crown', is filled with royal blue para. I decided that I wanted to combine the peacock and royal blue beads in the crown, but I wasn't sure they'd go well together. For a fun comparison, here's a photo of the big flower on the original design. In the original, the dark blue petals are stitched with something akin to a beaded padded satin stitch. Please remember that when I change something there is no implied criticism of the original! I just like to play around and experiment. Next up will be filling the leaves on the bottom half. I still have to figure out what I want to do with the curly thing at the top--it's going to be shaded with thread--before I can stitch the upper leaves. For now, I'm going to procrastinate with the leaves down below. I love to follow you along on this one Margaret! Your couched lines are so smooth! I'm looking at the picture of the original design. The background is filled with black beads? How densely are the beads applied? I ask because I feel like I might be packing in too many beads in the background of my own piece Hanabatake. As for the black bead filling on the original, it looks to me like it's well over half filled with para, perhaps around 2/3 filled. In my photos, the amount of fill varies a bit, but it's not completely filled. Looks beautiful! 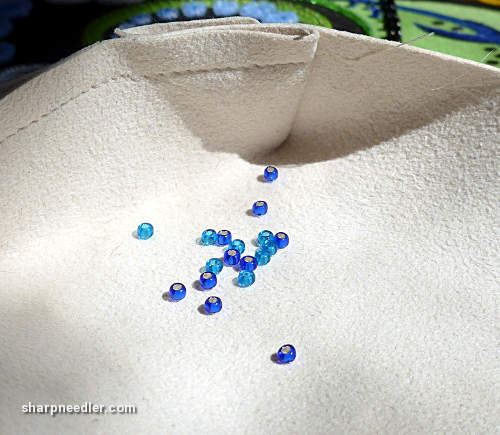 I love those couched pale blue lines and how smoothly they take the curve: I have never used a koma, but would like to try to get into bead embroidery so I will have to try and find one or make one :) I've never heard of para filling either but it's very pretty! Thank you, Aurelia. If you're going to do bead embroidery with couched lines of beads, do yourself a favour and get a beading koma. If you go to my Gallery, then the project 'Wild Child' and click on the link about the beading koma there's a link to a source to buy one. It's worth every cent. 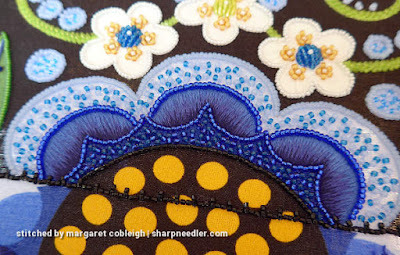 I really love the combination of the silk shaded area when combined with the beading. Your silk shading is always so beautiful, and I love the effect. Such a lovely project! I love the details the beads are giving to the flowers, very pretty. Lovely work.